Dec 21, 2017 • Kelp forests grow along coastlines worldwide, largely hidden from view. Like rainforests, they’re among the planet’s most important ecosystems: beautiful but fragile habitats for a wide array of plant and animal species. To gather a fuller picture of the forests, and to monitor them over long periods of time, Cavanaugh recognized he could draw from USGS and NASA’s Landsat program, which has taken satellite images of the entire Earth every 16 days since the 1970s. 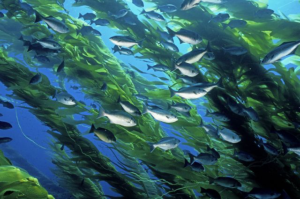 Landsat collects data in the visible and near-infrared wavelengths, which made it an ideal tool to track kelp forests: Because water absorbs a lot of near-infrared energy and plants reflect a lot of it, the kelp forest canopies stand out in the satellite images.